The former vice president, who has also lost children, has been offering advice to some families of the school shooting. WASHINGTON — The event that took Joe Biden to the Palm Beach-area town of Wellington on Tuesday was close to his heart — a fundraiser for the foundation established in the name of his late son, dedicated to protecting young children. What drew Fred Guttenberg to meet Biden there was the connection he now shared with the former vice president, as a father who has also lost a child far too soon. Guttenberg 's 14-year-old daughter, Jaime, was one of the 17 people killed in the mass shooting at Marjory Stoneman High School in Parkland, Florida, on Feb. 14. And on Tuesday night, he became the latest parent of one of those victims to spend a few moments in conversation with Biden, who has twice faced deep private loss in the public spotlight. 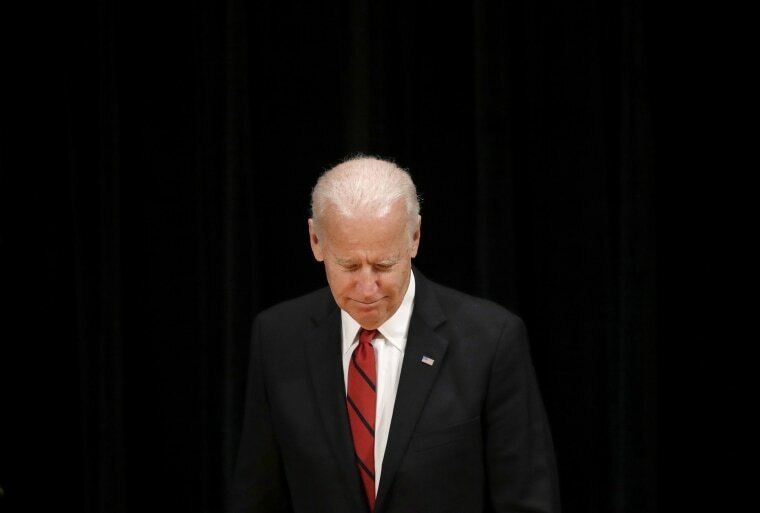 Over the course of 45 minutes, Biden spoke with Guttenberg and the father of another victim “about loss — his, ours, how to get through it,” Guttenberg said in an interview. At one point, Biden asked a mutual acquaintance to leave the room so the three men could have an even more personal conversation. “It was, honestly, one of the most healing moments that I’ve had in the last five weeks,” Guttenberg said. A spokesman declined to comment on Biden’s outreach to the Parkland families, which was described by three individuals who helped arrange it. Biden himself was reluctant to share details when asked about the discussions on Friday. "I know how important it was to me, and I know it's important to them, he said. Biden made it known in the days after the Parkland shooting that he wanted to be a resource for the families, to offer both his personal condolences and words of advice about the difficult road ahead, should they want to seek it. “The vice president, unfortunately, has direct, personal knowledge of what it’s like to grieve for the loss of a child," said Rep. Ted Deutch, D-Fla., who represents Parkland and has helped connect Biden with victims’ relatives. "And the conversations that he’s had with the families have been very personal — about not just this moment, but the coming weeks and months, and the challenges of moving forward." Many of the conversations Biden has had have taken place over the phone. But as part of a previously scheduled trip to Florida this week, Biden was told that the father of two Parkland victims were going to attend the Beau Biden Foundation fundraiser as guests of another attendee. Guttenberg had spoken with Biden by phone within a week of his daughter’s death, and took similar calls from other elected officials including Deutch, Sen. Bill Nelson, D-Fla., and Gov. Rick Scott. He also met personally for an hour with Sen. Marco Rubio, R-Fla., whom he has been critical of at times for his pro-gun stance. But the conversations with Biden were different, Guttenberg said. "He talked to me about both instances of tragedy in his life. He talked a lot about how finding mission and purpose after each of those helped him, day by day, put distance between what happened and finding a new place. It doesn’t remove the pain, but it moves it further away,” he said. Biden had just been elected to the Senate in 1972 when his first wife and infant daughter were killed in a car accident just before Christmas; his two young sons were also severely injured. Beau, his eldest son, died of brain cancer in 2015 while Biden was vice president, and was still considering a bid for the presidency. Perseverance in the face of personal tragedy became a defining characteristic of Biden’s four decades in public office — a burden that he has said came with obligation. “I believed it was my public duty to demonstrate to those millions of people facing the same awful reality that it was possible to absorb real loss and make it through,” Biden wrote in a 2017 book detailing his son’s final years. As vice president, Biden often joined President Barack Obama in consoling victims of mass shootings. The two spent hours with victims of the Pulse Nightclub massacre in Orlando, Florida, in 2016, as well as the Sandy Hook Elementary School shooting in 2012. Biden often insisted to relatives that they follow up with him. During his two conversations with Biden, Guttenberg said he offered support for his new mission advocating new gun safety laws, and advice about how to go about it. Biden has also offered to be a resource to the student activists who have led a new national movement to promote new restrictions on gun ownership. As thousands are expected participate in national “March For Our Lives” events this weekend, Biden met privately some of the movement leaders in Washington on Friday, and will perhaps participate himself in the National Mall gathering Saturday. As a senator, Biden was lead author of a 1994 crime bill that included an assault weapons ban. After the Newtown massacre, Obama asked Biden to lead a task force that made recommendations about other gun policies that could be enacted either legislatively or through executive action. But allies say Biden recognizes that the strength of the movement is not in the high-profile names who seek to attach themselves to it. "We can beat the NRA," Biden told NBC News as he arrived for the student meeting Friday. "We'll do it again, because of these kids." “They’ve got an enormous amount of passion, and I think he offers them the example of someone who has taken that passion for change and made it the central purpose of his life," the congressman said.